In general, overhead transmission line corridors range in size from approximately one hundred to several hundred feet wide, depending on the power-carrying capacity and the number of lines routed through the corridor. Due to their linear nature, transmission corridors invariably cross natural features such as streams; floodplains; forests; rare, threatened and endangered (RTE) species habitat; and historical and archeological sites. Siting new transmission lines or modifying existing lines requires careful planning and implementation to avoid impacts to these resources. Several new transmission lines have been proposed across Maryland recently in response to PJM’s transmission planning and federal studies that indicated that the northeastern U.S. is in critical need of increased transmission capacity and reliability. Furthermore, offshore wind power facilities proposed for near the Maryland coast would require both offshore transmission and additional large capacity transmission lines on the Eastern Shore. CPCN applications for interstate transmission projects like these raise many unique environmental and socioeconomic challenges, such as preserving natural habitats along the Atlantic Coast, shielding the views and vulnerable stream habitats of suburban central Maryland, protecting the sensitive bottom habitats of the Chesapeake Bay, or ensuring the security of power delivery to populations and facilities in Washington, D.C., Baltimore, Maryland, and other urban areas. Currently there are numerous transmission line projects, located throughout the state, that are in various stages of review/approval. PPRP reviews the environmental impacts of proposed transmission line projects from a number of perspectives. The review considerations and typical impacts are summarized in the following subsections. Wetlands are among Maryland’s most valuable natural resources. Tidal wetlands are protected by the Critical Area Act, and non-tidal wetlands — including wetlands in utility rights-of-way — fall under the Non-tidal Wetlands Protection Act. Maryland’s overall goal is no net loss of non-tidal wetlands acreage or function. To achieve this goal, the State requires that any unavoidable wetland losses be replaced at least acre for acre. Greater replacement ratios (up to 3:1) are specified for forested wetlands and Wetlands of Special State Concern. To construct a transmission line project in a wetland, the developer must obtain a Letter of Exemption, a State Programmatic General Permit, or an Individual Wetlands Permit that details project-specific conditions from MDE, or the U.S. Army Corps of Engineers or both. While new routes are usually planned so as to avoid wetlands, rights-of-way constructed prior to the Non-tidal Wetlands Protection Act were often less favorably sited, and many undesirable wetland impacts exist. For example, the Burtonsville to Takoma Park transmission line route in Prince George County, Maryland, would probably not be built today. It traverses sensitive wetlands and streams including Little Paint Branch Creek, which has one of the state’s last brook trout populations. Wetland impacts result when vegetation, soil, or water flow is altered by a transmission line right-of-way, either directly or indirectly. In the past, transmission line access roads within wetlands were often particularly damaging, because fill was used to raise the roadbed above the water table, changing both the natural drainage and the soil characteristics. Parts of the wetland that are isolated from their water source by the road or associated ditching can dry up. Conversely, parts of the wetland upstream (or up-flow) of the blockage often are permanently flooded. In addition, without proper management practices, invasive plants tend to colonize areas on and directly adjacent to a dry elevated road bed and compete with the adjacent wetland plants for sunlight and water. As a result of vigilant permitting oversight by MDE, U.S. Army Corps of Engineers, and DNR, and appropriate planning by the utilities, transmission line access roads are now rarely constructed in wetlands. The preferred access for pole placement and line maintenance near wetland areas is via access points on either side of the wetland, avoiding direct impacts. Where upland access is not possible, matting can often be placed over the wetland area to minimize damage from equipment and activities, without building permanent roads. Indirect construction and maintenance impacts to wetlands are primarily caused by soil disturbance in uplands that allows runoff to convey loosened soil into streams and associated wetland areas. Construction activities can also disrupt nearby wetland habitat, especially during critical reproductive periods for the plants and animals that comprise the wetlands ecosystem. Impacts can often be minimized during construction by use of appropriate best management practices. After construction, impacts can be reduced by refraining from mowing or using other equipment within wetlands areas and using EPA-approved and appropriate herbicides to eliminate non-native invasive species in or near wetland areas. Overall, transmission line construction has the least impact on wetlands when poles are placed in uplands areas, well away from the wetland area, or lines are placed in horizontally-bored duct banks below the wetland. Right-of-way management has historically used a simplistic paradigm of clearing all vegetation, reseeding with grasses, mowing frequently, and/or applying herbicides to kill shrubs and tree seedlings that invade the right-of-way. This approach allowed easy access to the transmission line, but was frequently detrimental to natural habitats as described in the preceding sections. Right-of-way clearing should be kept to the minimum width necessary to prevent interference from trees and other vegetation. Selective tree cutting and removal should be used, targeting only trees which could cause damage to the line. The right-of-way edges through forests or timber areas should be curved, undulating boundaries, not straight “walls” that create a “tunnel” effect. Small trees and plants should be used to feather the height of the right-of-way vegetation from grass and shrubbery near the center to larger trees at the edges. Rights-of-way that are constructed through Green Infrastructure hubs and corridors split them into smaller, disconnected pieces (fragments) and diminish their ability to function as integrated habitat units. While the area of the removed forest may not be great, there may be severe consequences for the species that depend on the hub or corridor habitat. Invasive plants such as Japanese honeysuckle, Korean bush clover, Asiatic bittersweet, and wicker microstegium can grow prolifically in the cleared-edge habitats of transmission line rights-of-way and can spread into the forest interior, limiting the growth of native species. Careful vegetation management in the right-of-way can mitigate some of these effects. 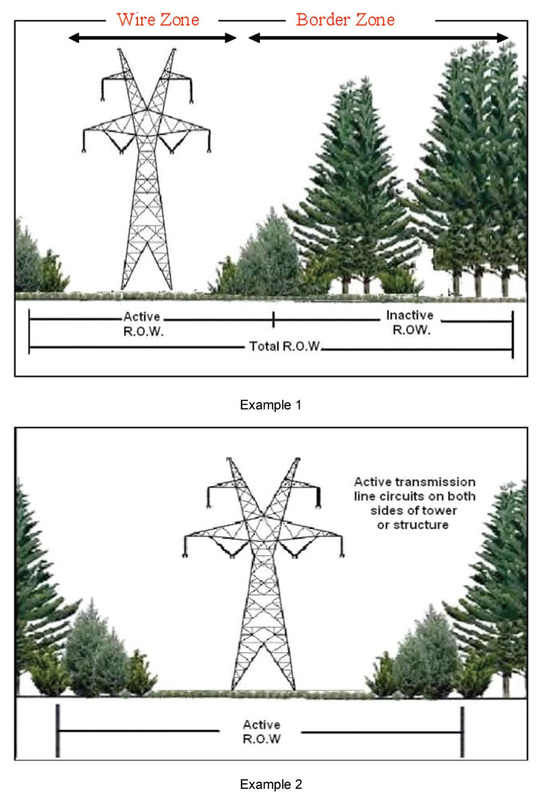 For existing transmission line rights-of-way in Green Infrastructure areas, expansions of the right-of-way into the surrounding natural territories can be particularly harmful. Siting new transmission lines within Green Infrastructure network components is strongly discouraged unless it is not possible to bypass the Green Infrastructure system and align the new transmission line with pre-existing disturbed and degraded areas. A large portion of the transmission line rights-of-way in Maryland are located in otherwise undeveloped areas that provide abundant wildlife habitat. Although many construction impacts are temporary, the long-term habitat alterations often continue to affect birds, terrestrial animals, amphibians, and fish. A transmission line right-of-way through a forested area creates cleared areas with abrupt edges that are not desirable habitat for forest interior dwelling species (FIDS), and often provides a corridor for invasive species that compete with or prey upon native forest species. The effects of these changes are particularly severe near forested streams and wetlands. While there are lesser impacts in shrub-scrub and agricultural habitat areas, maintaining the right-of-way in a mowed state can still result in gaps between natural habitat patches. Such gaps can present an insurmountable barrier to some species, thereby isolating the populations. Even highly mobile species may not be able to maintain a coherent population under these circumstances, because individuals that attempt to cross the cleared area may be exposed to a high risk of predation. Forest interior habitat may support many species, including but not limited to FID species of birds, terrestrial mammals, reptiles, amphibians, and plants. The forest interior habitat is uniquely productive and protected, and may form a core refuge for common forest species that also live in or near forest perimeters or non-interior areas. FID species, however, are particularly sensitive to the size of the remnant habitat patch. Interior habitat is defined as a contiguous zone of forest that is more than 300 feet inside of the edges of the forest area, and is dependent on the shape of the area as well as its total size. Long-term research by DNR indicates that interior habitat usable by some plant and animal species can exist in forest parcels as small as a couple of acres, but sufficient interior habitat to support resident breeding populations of FID birds generally requires several hundred acres. According to the Natural Heritage Program, the populations of many FID birds are declining in Maryland, often because of loss of suitable amounts of habitat. Thus, the effect on FID species of a transmission line corridor that splits or reshapes the edges of a large forest parcel may be significant, and the impact can be particularly damaging in patches smaller than 100 acres or in riparian areas. Another potential impact of transmission lines is bird collisions and electrocutions. 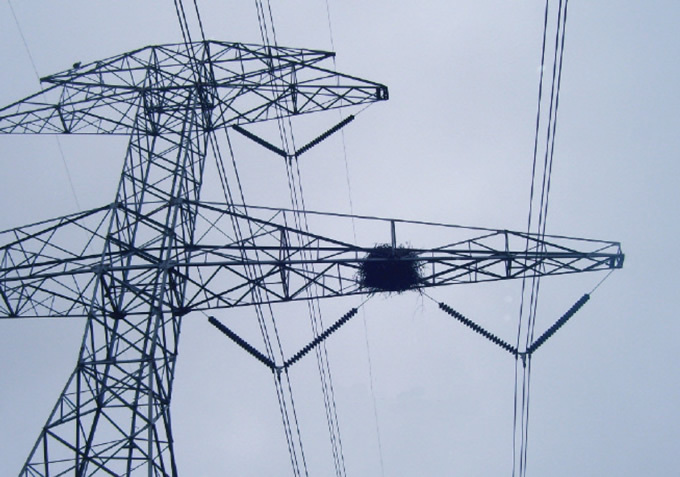 Eagle nests have occasionally been found on transmission line towers (see Figure 4-23). The U.S. Fish and Wildlife Service and the Avian Power Line Interaction Committee have cooperatively developed guidelines to help prevent injuries to birds that contact power lines. The State uses the voluntary guidelines, as updated in October 2012, to help utilities develop Avian Protection Plans that meet the specific needs of their facilities, protect birds from electrocution and collisions, and reduce the likelihood of power outages caused by bird collisions. Most rare, threatened, or endangered species are composed of small populations that occupy localized environmental niches. Avoiding anthropogenic effects in these locations is the critical step in protecting the species, since even small disturbances may place the remaining population at risk. New transmission line corridors are usually an undesirable disturbance, although the habitats created by existing transmission line rights-of-way sometimes create an ideal niche for a threatened or endangered species. For example, the state endangered Eastern tiger salamander (Ambystoma tigrinum) was noted in the proposed Church to Townsend transmission line project. Tiger salamander eggs were found by a DNR Wildlife Ecologist in a ditch perpendicular to the right-of-way in the vicinity of Millington Wildlife Management Area. This was the largest tiger salamander breeding output found in Maryland since 1997. In addition, several more egg masses were found in two other locations in or near the right-of-way. As part of the licensing process, PPRP included a license condition specific to the protection of the tiger salamander that includes the maintenance of a 500-foot buffer around all known tiger salamander ponds and wetlands, as well as a timing restriction on construction and maintenance activities within that buffer area. Other species found in eastern shore ROWs can include the white fringed orchid (Platanthera blephariglottis), sometimes in large patches that are subject to catastrophic disturbance during construction in these ROWs. PPRP reviews each case carefully, and in several recent cases has required the presence of an on-site third-party environmental monitor during construction activities to help avoid or minimize impacts. The Maryland DNR Wildlife and Heritage Service (WHS), Natural Heritage Program, maintains a database of all known populations of the State’s designated rare, threatened, and endangered plant and animal species, with particular attention to those that require special habitat protection to support viable populations. The route of every proposed new or modified transmission line is compared to this database to identify all possible impacts to known populations and also to identify habitat that may be suitable for any rare, threatened, or endangered species. If appropriate habitat is available, certain species could be present without documentation because adequate surveys have not yet been conducted. When habitats and potential habitats are identified in the vicinity of a proposed project, PPRP and WHS work together to make specific recommendations for each species. These include field surveys and protecting or mitigating impacts to any populations present, including avoiding disturbances during breeding seasons or migrations, controlling hydrology impacts during and after construction, controlling and monitoring sediment disturbance, and restricting actions or operations that will disturb or injure individuals of a vulnerable population. The impacts imposed by transmission line rights-of-way can be distributed over the landscape and affect many types of terrestrial natural resources. Small impacts to a resource, such as a forest or a watershed, at several locations can add up to a significant overall impact. At sensitive locations, such as stream and wetland crossings, small impacts to several different resources (e.g., forest, wetland, and stream riparian areas) can disrupt the overall integrity of the ecosystem. These additive impacts of the right-of-way are called cumulative effects, and are a serious concern where ecosystems are near a critical threshold or are already degraded. Because the health of an ecosystem depends on functional interactions between its components, cumulative impacts can have a result much greater than a simple tally of the individual impacts would suggest. Cumulative effects can be assessed in several ways. The effect of multiple stresses on an ecosystem is usually evaluated in a context that defines a standard for permissible impacts or a goal for restoration. For example, Maryland’s Green Infrastructure network defines areas where natural conditions should be maintained or restored, while the Critical Area Law restricts development in all sensitive habitats around Chesapeake Bay and its tidal tributaries. Individual resources, on the other hand, are handled in terms of specific impact thresholds or goals. For example, Maryland has set a “no net loss” standard for forests under the Forest Conservation Act and for freshwater wetlands under the Non-Tidal Wetlands Protection Act. Forest clearing in a right-of-way provides an example of the nature of cumulative effects. One proposed project will require expanding the cleared width along roughly 30 miles of an existing right-of-way in southern Maryland. Although the width of additional clearing is only 100 feet and may not have large local consequences, over the length of the line it totals to hundreds of acres of forest loss. The permanent removal of this much forest would be a significant regional environmental cost of the transmission line right-of-way. Another transmission line right-of-way in southern Maryland, which was recently evaluated in response to a CPCN application to upgrade the capacity of the line, illustrates the multiplicity of impacts that must be considered. The right-of-way crosses in excess of 20 streams, at least 14 acres of Chesapeake Bay Critical Area, requires at least 20 poles in or near wetlands, fragments forest-interior-dwelling species habitat along its entire length, and affects a total of 179 acres of Green Infrastructure hubs or corridors. These statistics alone speak to the large and measurable cumulative effects that transmission line rights-of-way can have on some of Maryland’s most critical natural resources. In existing transmission line rights-of-way, past maintenance activities will have shifted the vegetation toward low-profile species, such as grasses, ferns, herbaceous plants or forbs, shrubs, and tree saplings. 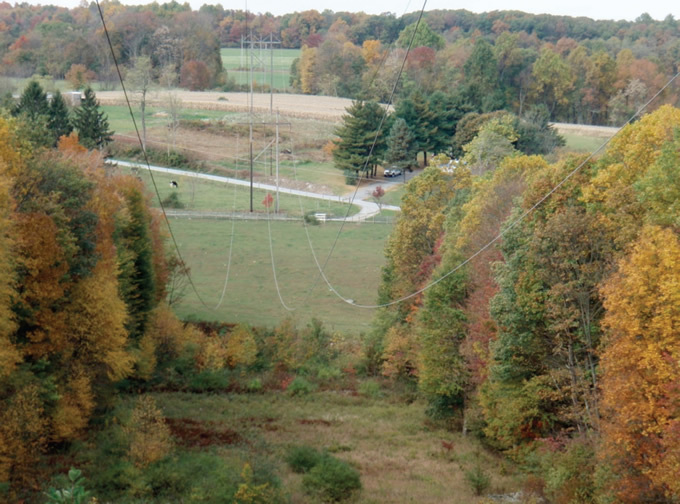 Figure 4-24 shows an example of typical transmission line vegetation management practices in Maryland. Many of the species present in the right-of-way may be non-native species that were planted after the initial clearing to prevent soil erosion, or weedy and invasive species that have taken advantage of disturbed habitat in the corridor. In a few places where clearing to maintain the right-of-way has not been frequent, taller vegetation may be present, but generally the right-of-way will be open, with sparse vegetation cover and a different assemblage of plant and animal species than is present in the adjacent areas. The bordering ecosystems (within 100-300 feet of the right-of-way boundaries) can also be degraded to some degree when the vegetative community within the right-of-way has been significantly disturbed or altered by construction and maintenance, such as in forested areas. Source: K. Sillet, Versar Inc. Trees in or near transmission line rights-of-way have historically presented special maintenance problems. While it is environmentally desirable to remove as few trees as possible, fallen trees and branches can have a major impact on reliability. In 2014, 22% of the total outages throughout Maryland were caused by contact with vegetation. There are fewer tree fall events that cause outages of larger transmission lines; however, DNR has joined with the Maryland Electric Reliability Tree Trimming (MERTT) Council, which typically focuses on lower-voltage lines, to develop a clear picture of trees that cause power outages in Maryland. Utility foresters are identifying each instance of a tree-caused power outage and recording the location, type of tree, and other details. DNR is assembling the data from utilities throughout the state into a common database, and analyzing the data to provide the PSC with accurate information on the causes of such outages. The results will be used by MERTT Council members and DNR to evaluate current data collected following the implementation of new vegetation management standards, known as RM 43. These standards dictate how close tree branches can grow to power lines, typically within a 4-year vegetation management cycle. They also allow utility companies to identify and remove hazardous trees near power lines. Improperly maintained vegetation in a transmission line right-of-way can disrupt the integrity of the system and cause power outages. The North American Electric Reliability Corporation (NERC), operating under the oversight of Federal Energy Regulatory Commission (FERC), develops and enforces reliability standards for transmission lines. Current best practices and requirements for reliability are codified in NERC Reliability Standard FAC-003-3 (Transmission Vegetation Management), which was approved by FERC on September 19, 2013 and is being phased in over time. The standard requires transmission owners to have a documented Transmission Vegetation Management Program (TVMP) for all transmission lines operated at 200 kV and above, as well as for designated sub-200 kV lines and generator interconnection facilities. The purpose of the TVMP is to improve the reliability of the electric transmission systems by preventing outages from vegetation within a right-of-way. The TVMP must identify and document clearances between vegetation and overhead conductors, taking into account voltage, sag under maximum load, and wind velocity on conductor sway. Minimum vegetation clearance distances (MVCD) are required for alternating current voltages. The calculated minimum distances to prevent spark-over between conductors and vegetation at various altitudes and operating voltages are specified in the standard. In addition to maintaining the MVCD, the transmission owner is also required to specify the methods that will be used to control vegetation and has the option of adopting the procedures and practices in the American National Standard for Tree Care Operations, Part 7 (ANSI A300). The TVMP must also include a schedule for annual right-of-way inspections. Transmission companies are required to maintain rights-of-way in a condition that assures the reliable delivery of power in accordance with NERC standards. Although it has been common practice to achieve this goal by clearing and mowing the right-of-way, such vegetation management practices are not required and may cause unnecessary environmental damage, especially in sensitive areas and through forested habitat. The alternatives suggested in the Guidelines of the Working Committee on Utilities, and other advanced techniques such as the Integrated Vegetation Management approach recommended by the International Society of Arboriculture, can be implemented as long as the required clearances are maintained. In general, most Maryland utilities use uniform, system-wide practices that may be more aggressive than NERC requirements. After forested land is cleared to create a transmission line right-of-way, a number of methods to maintain a low stature vegetative community within the right-of-way are generally used, including mechanical clearing, selective removal and pruning of problem trees with chainsaws, and application of herbicides. Mowing is the most common method of maintaining an open grassland habitat. Right-of-way corridors converted and maintained as open grassland habitat within forested habitats may not have much value for grassland breeding birds, and invasive and exotic species can be easily established in these areas. Clearing the entire right-of-way creates hard edges with no transition between habitats. Maintaining a scrub habitat, dominated by low-growing, bushy vegetation and young trees is preferable to mowing, particularly in forest habitats. It provides excellent habitat for wildlife including neotropical migratory birds, reptiles, amphibians and pollinators (see sidebar on Promotion of Native Pollinators). Leaving the right-of-way in a natural state to the maximum extent possible is the best alternative for protecting wildlife in sensitive areas. Creating curved or wavy right-of-way boundaries and piling brush from the cleared right-of-way so that it provides wildlife habitat would help mitigate impacts from right-of-way clearings in forested areas. Feathered, or soft edges, as shown in Figure 4-25, can be used to provide a transition from forest to open grassland or meadow habitat. Establishing a transition on both sides of the corridor that bisects a forested area with a medium height “border zone” along the edges, and a lower vegetated “wire zone” in the center of the corridor, referred to as the “U effect,” also reduces the effects of fragmentation on wildlife. A transition zone of scrub-shrub habitat of at least 20 feet in height within the right-of-way is recommended for rights-of-way through forests, since long linear meadows do not have much value for grassland birds and these open areas tend to facilitate the establishment of exotic species. Most Maryland utilities indicate that they now use a combination of selective herbicide application and mechanical cutting rather than exclusively one or the other. To encourage the implementation of environmentally friendly maintenance in rights-of-way, PPRP has, through its membership in the Maryland Electric Reliability Tree Trimming Council, compiled information on innovative practices that reduce adverse effects on local wildlife and plant communities, such as reduced mowing frequencies. Several of Maryland’s utilities have adopted maintenance programs to improve wildlife habitats in rights-of-way in limited areas. The introduction of desirable species into the right-of-way through “right tree/right place” plantings or wildlife habitat enhancement projects is often possible. Where implemented, such programs have created better, more stable habitats for wildlife, and have actually saved thousands of dollars in annual maintenance costs. Some research indicates that planting “connecting corridors” in the right-of-way between otherwise separated forest patches could be beneficial for many forest species. Such corridors could consist of native low-growing trees and shrubs that do not grow tall enough to present a danger to the overhead transmission lines. The State agencies encourage utilities to identify opportunities to create such cross-right-of-way connections, particularly in areas where the right-of-way fragments habitat used by forest interior dwelling species or crosses riparian areas and wetlands. PPRP continues to research the benefits of innovative best management practices for power line rights-of-way vegetation management. The Transmission Vegetation Management Programs of all applicants for CPCNs for new or modified transmission lines are reviewed by PPRP for compliance with the required standards and best management practices. As necessary, license conditions are recommended to the PSC for implementing such practices and for developing detailed vegetation management plans for sensitive locations along the ROW. PPRP maintains a database of these conditions, locations, and plans, and periodically inspects ROWs for compliance.